Looking for a way to keep up with Gogo's antics even while you're on the go? Then get his new mobile app available for iPhone, Android and Blackberry. It's FREE! It's simple to get and simple to use. Just point your mobile browser to: volu.me/davidgogo and you will be taken to the appropriate app store where you can download and install the app for free!! 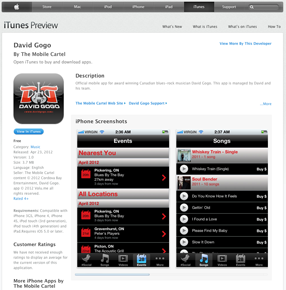 This is the only Official Mobile App for award winning Canadian blues-rock musician David Gogo and is managed by David and his team. Access EXCLUSIVE APP-ONLY CONTENT, as well as Songs, Music Videos, Live Interviews, News Releases, Upcoming Live Events and more. Interact with David Gogo and other fans from around the world. Receive push notifications when David Gogo is playing near you (including venue and ticketing information). With one click you'll be able to add event details directly to your iPhones calendar and buy tickets or invite your friends to attend the event through Facebook or email. You can even map out directions to the venue. You'll have all the up-to-date information about Gogo right in your pocket or purse in a handy, easy to use app regardless of what mobile device you prefer to carry!